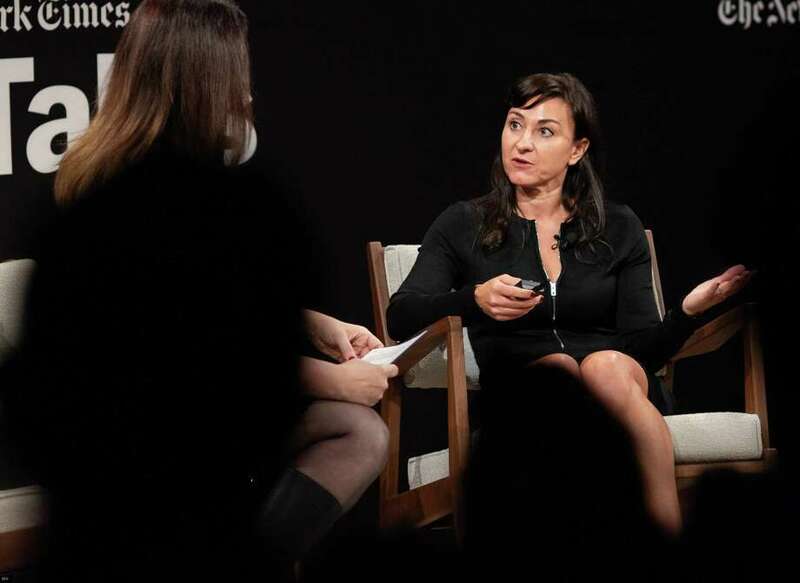 Westport native Lynsey Addario spoke with Rukmini Callimachi about photojournalism across the globe at a TimesTalks event at TheTimesCenter in New York City on Oct. 5. WESTPORT — Three years after her bestselling memoir, ‘It’s What I Do,” became a New York Times bestseller, Westport native and renowned conflict photographer Lynsey Addario has released a book of photos featuring her work from around the world. “Of Love and War,” Addario’s photo book, is out this month and traces her journey from photographing life under the Taliban before Sept. 11, 2001 to Addario’s more recent work depicting maternal mortality in Sierra Leone and victims of the global refugee crisis travelling from Syria to Europe. “I decided to start with Afghanistan under the Taliban because that was sort of the precursor to 9/11 that ended up being what launched me into a career in conflict photography and humanitarian and social issues like womens rights and women's issues,” Addario, 44, said. Addario, who now lives in London credits her success to her parents for telling her to follow her passions. “My parents never instilled any doubt in me. Anything I wanted to do, they encouraged me to do it and I think that helped me when I became interested in other countries and travelling around the world,” Addario said. A semester studying abroad in Europe while at the University of Wisconsin opened Addario to a worldview broader than the one she had while growing up in Westport, Addario said. Conflict photogrpaher Lynsey Addario to speak at Christ & Holy Trinity Church about her new photo book “Of Love & War” Oct. 29 from 7pm to 8pm. “When I started to travel, I realized how sheltered Westport was and how it represented such a small portion of what the rest of the world is like, whether that’s economic diversity or racial diversity. It’s pretty homogenous. I didn’t realize that as a young woman until I started travelling around the world, and that only inspired me to travel more because I felt I was missing so much, there was so much I hadn’t been exposed to,” Addario said. Putting together a photo book allowed her to unearth photos she previously overlooked in the fray of deadlines after reporting trips, Addario said, adding that while she often chides herself for not doing enough, looking at the book and how much she’s done in her career thus far is humbling. “I’ve worked a lot in my life and in many different countries. People have really let me into their lives in some of the most intimate moments. None of this work would have been possible without the generosity of people and the trust they’ve instilled in me to properly tell their stories,” Addario said.